Central College traveled to Europe with Global Football for a fifth time when the Dutch toured Austria, Germany and the Swiss Alps and took on one of the continent’s American football powerhouses. 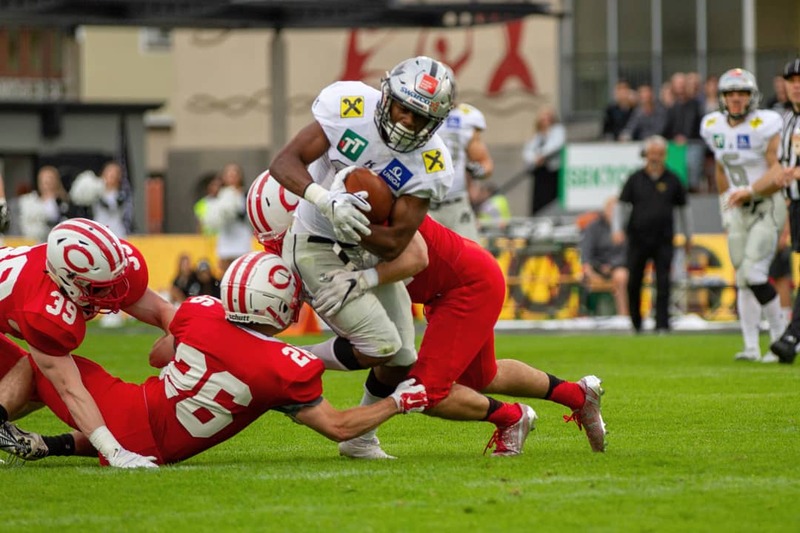 Coach Jeff McMartin’s Central Dutch faced the Swarco Raiders Tirol at the Tivoli Stadium in Innsbruck and were defeated 31-27 by one of Europe’s powerhouse teams. 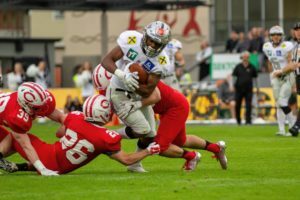 The final play of the game decided a thrilling clash between the Dutch and the victorious Raiders in front of a 2,500 attendance at the Gernot Langes Stadion in Innsbruck. In possession of the ball with five seconds remaining and trailing by five points, Dutch quarterback Blaine Hawkins was sacked by Maximilian Wild and the Austrian hosts held on to win 31-26 as time expired. Last year, the Raiders led Benedictine College by 13 points, only to fall 31-27 at the death. The lead changed hands five times and even when the Raiders opened an 11-point advantage in the fourth quarter, Central College always looked capable of staging a comeback. Central College has traveled and played overseas four times previously as part of Global Football tours, visiting Greece and Italy (2015), Italy (2011 and 2007) and Switzerland and Germany (2004). When not focusing on football, the Dutch traveling party visited Munich, Innsbruck and the Swiss Alps, starting their tour with brunch at Munich’s famous city center, the Viktualienmarkt, before heading out on a Munich orientation walking tour. They enjoyed a welcome dinner at the Rateskeller Restaurant for a truly authentic Bavarian experience. The overseas experience included a visit to the Dachau Memorial, tours of Innsbruck and the Neuschwanstien Castle a Trummelback Waterfalls walking tour and hike, white water rafting and canyoning.